Thank you for your letter of the twenty-sixth. It was like all your letters, most satisfactory. The papers enclosed will of course have my scareful attention and you put them before me in just the right way. 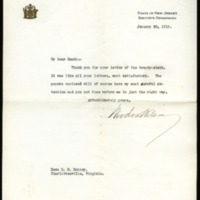 Wilson, Woodrow, 1856-1924, “Woodrow Wilson to Richard Heath Dabney,” 1913 January 30, WWP20479, University of Virginia Woodrow Wilson Letters, Woodrow Wilson Presidential Library & Museum, Staunton, Virginia.